We've been busily restocking our veggie plot this week with new lettuce, rocket, cabbage, more peas, and some broccoli in thus far... Have you been sprucing things up in your veggie garden??? I managed to make a total of 18 hankies and all it cost was a spool of thread (which I had in my stocks anyway). I used 2 old flannel baby wraps that have been in my linen cupboard since Connie (now 6) was born. I cut each up into 9 square-ish shapes and seen as though my over locker is currently out of working order I simply zig-zaged round the edges to limit the fraying. These hankies are super soft and a dream to wipe your nose with. 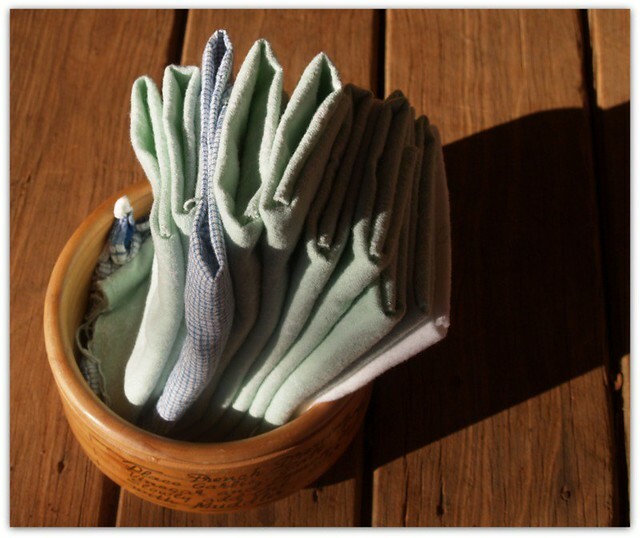 Do you make your own hankies too or do you prefer to use tissues??? Farmer Phil says he feels "naked" if he forgets to put a hanky in his pocket each morning!! Hankies for me Jodie, but most of our family prefer tissues. We have a couple of plums,a peach and an apricot, love them all. I think we need a mulberry and were told to plant it about now I think, must go to the nursery and check again. Another lovely post Jodie! Life sounds good at your place. We have about 300 olive trees around our sheep yards and house. We planted them initially for shade and shelter but last year we pressed our first olive oil, very exciting. They are great trees, so tough. We planted them potted. I am also experimenting with quince, apricot, pear, apple and fig trees. They are all still young but looking healthy. Happy planning and planting :) Sorry for the long comment. I love my orchard (I love all of my garden actually). I have filled mostly by buying online because there isn't the variety available close to where Il ive. So bare-rooted works best for me. Daley's is good and Heritage Fruit Trees for different apple varieties. The websites also tell you which ones need cross-pollinators etc which is handy. I can't help you with the stone orchard as we live in totally different climates and right now I have no fruit trees here. But I did just plant some lettuce and radishes and they are growing like crazy but it's so hot here I have to water them at least twice or three times a day. I've thought of making my own hankies but I don't use many paper products at all. That's a great idea to use "soft" fabric though.